Say goodbye to knots and tangles with the professional detangling brush from Kosee. 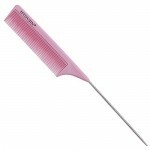 This uniquely shaped comb can be used with wet, dry, fine or thick hair. The unique teeth configuration it allows the teeth to flex upon contact with tangles, making sure that they are removed and not your hair. The ergonomically shaped handle fits perfectly into your palm to ensure a firm grip when brushing. A stress free experience makes brushing your hair easy, the perfect handbag companion.